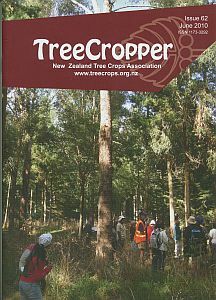 The Mandeville Meander 2010 Conference field visit took NZTCA members to the blackwood woodlot and sawmill of John and Robyn Fairweather – see more photos on page 32. Photo by David Colley. Scenes from NZTCA National Conference 2010, held in Christchurch 25-28 March. Southern Woods Nursery’s display of hedgerow plants. Lunch at the Brew Moon brewery and cafe in Amberley during a field trip. The Waipara Wander field trip bus, parked outside a massive gum tree at the gate of Limestone Hills. Note Cordane Precious Peggotty (Peg), the truffle-sniffing dog in the foreground. 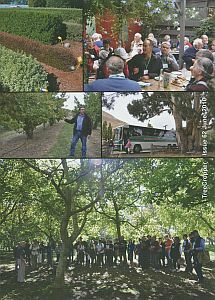 During the pre-conference tour to Lincoln University, international guest speaker Professor David McNeil (far left, front) discusses the Rex Baker Mermorial Walnut Trial, established in 1985. Gareth Renowden shows off his producing hazelnut tree, a seven-year-old seedling now supplying him with Perigord black truffles.